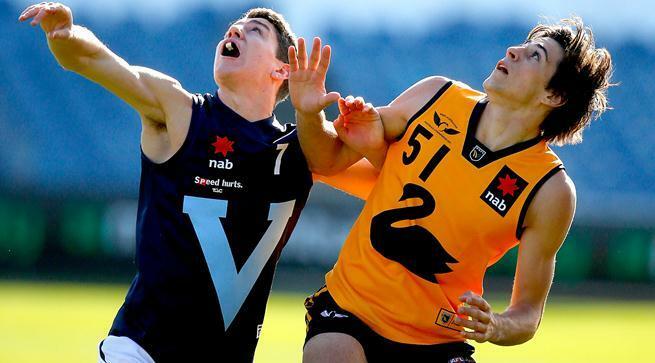 Vic Metro claimed its third win of the NAB AFL U18 Championships with a convincing 58-point victory against Western Australia at Simonds Stadium. The win sets up a tantalising final round encounter with South Australia, with a game plus 5.8% separating the two sides heading into their contest next Thursday at Simonds Stadium in the final game of the Championship. Metro is the only team to defeat SA in the Championships so far, and has highlights its best football in the last two rounds to be a serious threat to SA’s back to back title attempt. After an even first term, Metro flexed its muscle in the second quarter kicking five goals to one to set up the win. First use of the football out of the middle proved the difference between the two teams. Peter Wright once again helped give his midfield an armchair ride in the first half with 20 hitouts (24 for the game), and it assisted the likes of Christian Petracca (24 disposals), Angus Brayshaw (23) and Damien Cavka (21) push the ball forward for Metro. As they showed against SA in Round 4, Metro was not short of scoring options, with nine individual goal scorers. Darcy Moore (16 disposals, 4.1) started forward in this match and kicked two third term goals in one his best performances of the Championships. Paul Ahern (22d, 3.1) was elusive across half forward and Brenton Payne (15d, 3.1) added his third three goal haul of the Championships taking him to 11 goals in 2014. Vic Metro now holds its fate in its own hands, having to defeat SA in the final round for a chance at denying them back to back titles. Metro could still possibly beat SA, but lose the title on percentage which will make it a fitting finale to the 2014 Championship.